Karl Benjamin, a major Southern California painter and one of the original hard-edge abstract painters, opens an exhibition of paintings at Brian Gross Fine Art on Thursday, May 22, with a First Thursday reception on June 5 from 5:30-7:30pm. 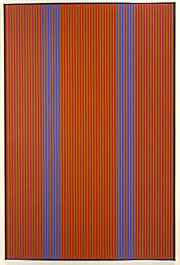 In his second exhibition with Brian Gross, Benjamin will present his vibrant geometric stripe paintings, created between 1979 and 1981. The stripe paintings exemplify the artist's concern with systematically dividing pictorial space with meticulous bands of color. Richly painted and ranging in size from two to six feet high, the canvases from this period are intuitively divided into vertical segments through Benjamin's intricately rendered narrow bands of color. The brilliant shades of magenta, orange, blue, green, yellow, and red seem to pulsate, emerging and receding from the deceptively flat surface, and giving each composition a unique optical presence. Intense and luminous, the stripe paintings are a dynamic interplay of color and geometry.